Patrick John Morrison was born on the 15th July 1939 in Los Angeles, California USA, and is the son of the legendary actor John Wayne, whose professional name he also took. Patrick followed in his father`s footsteps, and has appeared in over 70 film and TV titles, including “Rio Grande” (1950), “The Bears and I” (1974), and “Sinbad and the Eye of the Tiger” (1977), among others. Have you ever wondered how rich Patrick Wayne is, as of mid- 2016? According to sources, it has been estimated that Patrick`s net worth is as high as $12 million, an amount he has earned through his career as an actor. Also, his net improved thanks to his work as a television host, working in shows such as “The Monte Carlo Show”, and “Tic-Tac-Dough”. Patrick is the son of John Wayne and Josephine Alicia Saenz, who was John`s first wife. Patrick has three siblings. When it comes to his education, Patrick went to Loyola Marymount University, from which he obtained a degree in 1961. Even before he finished education, Patrick was already in the entertainment industry; influenced by the popularity of his father, it was only a matter of time when will Patrick step into acting waters. Encouraged by his father, Patrick appeared in the film “Rio Grande”, alongside John Wayne, and the two appeared together on screen in eight more films, including “The Quiet Man”, two years later, “The Alamo” (1960), “Donovan’s Reef” in 1963, “The Green Berets” (1968), and “Big Jake” (1971), all of which certainly increased Patrick`s net worth. In 1959, Patrick starred in the film “The Young Land”, and five years later appeared in the film, “Cheyenne Autumn”. By the end of the 1960s, he had also starred in films “Shenandoah” (1966), and “Eye For An Eye” (1968), which only increased further his net worth. 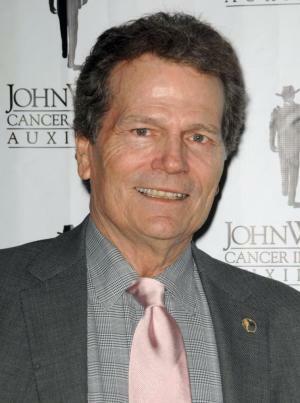 He continued successfully through the 1970s, taking roles in such films as “The Bears and I” (1974), “The People That Time Forgot” (1977), and in the TV series “Shirley” (1979-1980). Through the 1980s, Patrick was focused more on television, appearing in several series, and also game shows; some of his appearances included “Fantasy Island” (1981-1983), “Love Boat” (1979-1986), “Murder, She Wrote” (1987), “Body Language” (1984-1985), “Supper Password” (1985), and he also appeared in the film “Young Guns” (1988). Before he decided to retire in 1997, Patrick made further, sporadic appearances on TV and the big screen. His net worth increased further thanks to his appearances in such productions as “Kung Fu: The Legend Continues” (1995), “High Tide” (1997), and “Deep Cover” (1997), as Ray, which was his last appearance as actor. Thanks to his skills, Patrick won several prestigious nominations and awards, including the Golden Globe Award in category Most Promising Newcomer for his work on the film “The Searchers” (1956). After retirement, Patrick dedicated himself to philanthropy, and since 2003 has been the chairman of the John Wayne Cancer Institute. Regarding his personal life, he was married to Peggy Hunt from 1965 until 1978, and the couple had three children. In 1999 he married Misha Anderson, with whom he is still in marriage. 1 [on his acting debut in "Rio Grande" in a 1985 interview] I was visiting my father on location. It was the first time I was able to do that, and my father asked if I'd like to be in the picture.. He told me, "You come in, put the water on, and they give you $10." There followed other films, and he considers his work in them as being comparable to a summer job. If my father had worked in a paint store, I might have been stocking the shelves. 2 I don't know what it's like to be anyone else's son; it's the only life I have known. 3 [In a 1985 interview] There were incredible privileges and experiences in my life that obviously other children did not enjoy. I mean traveling around the world and meeting not only people within the industry, but others who gravitated to him; Presidents, politicians, royalty. When I was with him, I was treated differently - just because I was John Wayne's son... When I was very young, I didn't understand that being his son was like an extension of meeting John Wayne. I was very suspicious of people, very confused. It was on reflection later that I realized what was going on. 5 [In 1974] I don't think I'll ever be any more than a personality, but that's all right with me. 1 Currently living in Arizonia [September 2016]. 2 Among the summer stock and dinner theater productions Wayne starred in included 'My Three Angels," "Angel on my Shoulder," "Romantic Comedy," "Come Blow Your Horn," and "Arsenic and Old Lace" at the Burt Reynolds Theatre in Florida, which reunited him with Henry Brandon, his co-star in "The Searchers.". 3 "Big Jake" was the ninth and last of his co-starring roles with his father. 4 Fifteen year-old Wayne was big for his age and able to pass as a cadet in John Ford's "The Long Grey Line.". 5 Met his second wife, Misha Anderson, at a mutual friend's daughter's wedding at the Sherwood Country Club. 6 Stepson of Pilar Wayne. 7 Nephew of Robert E. Morrison. 8 Uncle of Brendan Wayne. 9 Was offered the role of Superman in the Superman (1978) film but declined because of his father's cancer. 11 Half-brother of Ethan Wayne, Aissa Wayne, and Marisa Wayne. 12 Son of John Wayne and Josephine Alicia Saenz.